Trained bands of foot soldiers were selected from all able-bodied men, to be called-up when required by the Crown, to provide a military force during turbulent times. The gentry were charged with providing mounted soldiers. All these men were summoned for musters and training once or twice a year for the purpose of showing themselves and their arms for inspection by the deputy lieutenant of the County. The musters were held in the larger towns of the County. The men called-up were 'sufficient and apt men' - freeholders, farmers, owners of land or householders. Such men of substance were required to avoid constant changes in personnel from muster to muster. Each town or village was bound to provide a specified amount of armour and weapons, and to send them for inspection and use at the musters. 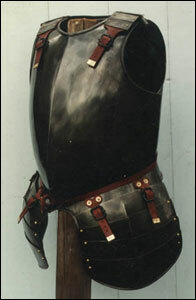 In the muster lists, the Corslet was the body armour of breast and back plate worn by the pikemen. The Musket was a heavy matchlock firearm used with a rest and the Caliver was similar to the musket but lighter and was used without a rest. COSGRAVE: - 1 corsslett, 1 calliuer. Robt: Emerson, 1 calliuer.